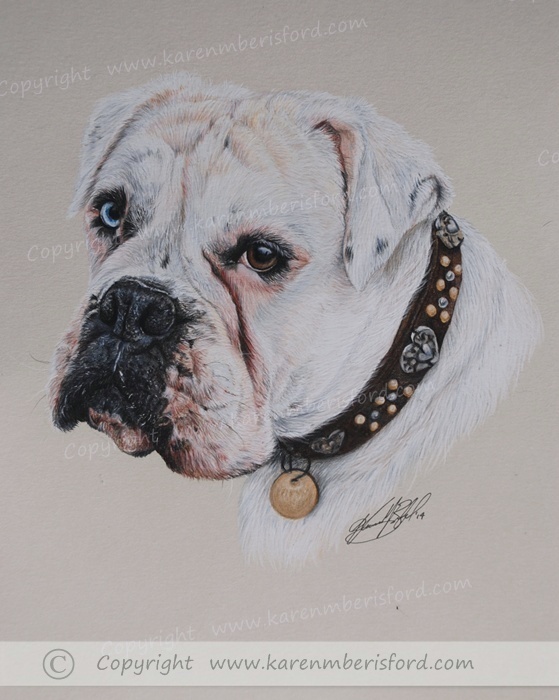 ​This is the second portrait of a Boxer trio being commissioned by their owner. The Commissionee, Sarah sent me a collection of images of Blanca and I immediately knew which image would be chosen for the portrait, however Blanca's collar was hidden by her stance on the photo and Sarah wanted her collar showing and so I put a rough 'mock up' together of the 2 images seen below to create the final reference image. When editing and cutting images this way you are disturbing and sometimes completely removing natural shadows and the flow of the fur as was the case in this instance - it was a challenge ensuring the join under the chin between jawline and collar joined correctly and looked as natural as possible, and had to use other images in my large Boxer dog photo reference library to ensure this was the case. The reference photo is being used for the head and a second photograph is being used for Blanca's gorgeous collar. I fused the 2 images together in one so I could check the perspectives and work with the image in mind. Here are the other Coloured pencil portraits that I produced for the owner. Each portrait has it's own page and you can click on either image which takes you to the chosen page showing the process of how they came together.